Background: Venerable Prajnananda Mahathera is a Therevada Buddhist monk and chairman of the Banophool Adibashi Green Heart College, a school serving underprivileged indigenous and Bengali youth. In this conversation with Nathaniel Adams in Dhaka, Ven. Mahathera describes how his drive to complete his education as an orphaned boy led him into the monkhood and to become a passionate advocate for education in the neglected Chittagong Hill Tracts region. The Moanoghar School, which he founded, is widely renowned. Ven. Mahathera highlights the key role of the Buddhist sangha in supporting indigenous communities in Bangladesh, and comments on some of the grave challenges these communities currently face in Bangladesh. You have dedicated your life to education and providing support to underprivileged and impoverished indigenous children. How was this inspired by your own experience as a youth? I passed my boyhood in very difficult conditions. I was born in Babrura Village in Kachrachari District, Chittagong Hill Tracts. I am a member of the Chakma indigenous group. When I was just one year old, I lost my father and I became an orphan. I was the youngest of the four brothers. My mother tried her very best, but because we had lost our father, my family was very poor. Sometimes I had to go to school without food. I would go collect jungle roots to eat. Most of the time, when I went to school I was only half-fed. In spite of the challenges I was always motivated to succeed academically. When I passed class five, I became a teacher in my community to earn money for my family. You were working as a teacher after only class five? Yes, I taught around 45 students. I was only about 10 or 11 years old. My students were older than me! Every day I went to school on foot. The school was just outside of our village. I earned 25 taka ($0.30) per month. Each year for 10 months I worked as a teacher, and for two months I assisted my older brother with the jum(shifting cultivation). As the youngest brother, I was obliged to help him. My mother also lived with him. After working 10 months as a teacher I couldn’t even save a single poisha (smallest unit of Bangladeshi currency) for my future. I was a young boy at that time, so my friends would come and invite me to go to the shop and take a tea, and if I had anything extra I would join them. Then, one of my relatives, a very kindhearted man named Bishush Kanti Chakma, allowed me to live in his house as a housekeeper. He was an important man in the community. He owned land and collected taxes from the tenants. He sheltered me for two years. With his help I was able to enter Babosura Junior High School in Khagrachari District, for classes seven and eight. I was very studious and always the first in my class. After passing class eight, Bishush Kanti Chakma told me that because of money problems he was unable to continue supporting my studies. He asked me to leave his house, but told me that if I married a girl, he would give me five acres of paddy land. I thought it over, but I was unable to accept his proposal. I decided to go to another village as a teacher again for a further 10 months, but I still wasn’t able save any money for my future. I was determined to earn some money so that I could continue my education so I joined a group of bamboo collectors in the deep jungle. I went to the jungle and collected 3,000 stalks of bamboo over three months. Most of the bamboo I had to carry on my back to the stream where we floated it down to Kaptai Lake. I sold the 3,000 stalks of bamboo and got 1,500 taka (US$20). With that money I came to Rangamati to buy books and some clothes and returned to my village. Again I faced problems. I could buy the books, but how could I get admission to school and where would I stay? These were very serious concerns for me. Was this when you decided to enter the monkhood? I was told about an orphanage and school called Parbatya Chattal Boudha Anath Ashram, which was an organization run by a group of engaged Buddhist monks. They offered me shelter and support to continue my education. With their help I passed the Secondary School Certificate exams (SSC) and afterwards I was ordained as a samanera (novice monk). My preceptor’s name was Venerable Jnanasree Mahatera. This was maybe 1964 and I was about fourteen at the time. When I was in Parbatya Chattal Boudha Anath Ashram as an orphan boy, I received training from Shudhi Barua in accounting; how to manage cash books, ledger books, and balance a file. He trained me how to maintain an organization’s finances in an organized way. I soon became the organization’s accountant. My preceptor gave me this responsibility. After I was granted higher ordination, I spent one and a half years in the Parbatya Chattal Boudha Anath Ashram. I served the orphan children as a teacher without a salary for one and a half years, as a volunteer teacher. In 1969, I came to Chittagong for higher secondary school. I stayed in a temple called Mirzapur Shantidham Vihar under Venerable Silaralankara Mahathera. At that time he was the Supreme Patriarch of Sangharaja Nikaya. After a year and a half I was asked to become Abbot at another temple in Chittagong called Jugura Shugata Vihara. Eventually I took Higher Secondary School Certificate exams (HSSC) from Hathazari College and after passing the HSSC, I took admission in the Chittagong University in Bengali Language and Bengali Literature. How did the insurgency in the Chittagong Hill Tracts affect your plans? In 1974, Venerable Jnansree Mahatera asked me to return to Chittagong Hill Tracts due to the increasing political turmoil. This was during the very beginnings of the insurgency led by Shanti Bahini, the armed wing of Parbatya Chattagram Jana Sanghati Samiti (United People's Party of the Chittagong Hill Tracts). When I returned he asked me to take the charge of Parbatya Chattal Boudha Anath Ashram as the general secretary of the orphanage and I accepted the position. When I took responsibility for Parbatya Chattal Boudha Anath Ashram it was far from Rangamati. As you know Chittagong Hill Tracts is divided into three districts Khagrachari, Rangamati and Bandarban. Rangamati is the capital of the Chittagong Hill Tracts. All administrative offices were in Rangamati at that time. In those days it took two days to get from Parbatya Chattal Boudha Anath Ashram to Rangamati because of poor road connections. You needed to travel partially by boat and partially on foot. At that time I was still in my second year of university and I was obliged to return every month or two. The journey was very difficult for me. I told my preceptor Venerable Jnansree Mahatera that I would you like to establish a branch of Parbatya Chattal Boudha Anath Ashram in Rangamati. I requested that he give me 10,000 taka ($130) to buy a plot of land and he agreed. With that 10,000 taka I bought 4 acres of land. On that land at first we established a Buddhist temple named Rangapani Milan Vihara. Eventually after we raised the funds from the local community we build a simple small school building just adjacent to the temple. In 1974 we welcomed the first 35 students to the Rangamati branch of Parbatya Chattal Boudha Anath Ashram. How and why did that school eventually become Moanoghar? In 1978 I passed the honors M.A. from Chittagong University. One of my older brothers took his M.A. in philosophy at Dhaka University. We are not blood related, but we have the same preceptor. 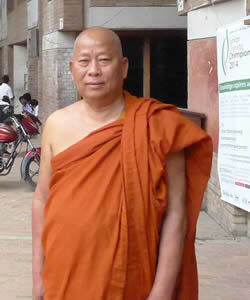 His name is Venerable Bimal Tissya Mahathera. While he was studying in Dhaka he stayed in the Kamalampur Buddhist Temple, which runs the Dhammarajika Buddhist orphanage. One day a French couple, Pièrre Marshan and his wife Neige, were visiting the temple. They ran an organization called POTAS that supported the orphanage. There were several Chakma monks there at the time and Neige was very curious about them. She wanted to know which part of the country these people came from. You see the Chakma people look very different from Bengali Muslims and even Barua (Bengali) Buddhists. Their appearance is not the same. Once she asked my older brother, “Where are you from? You do not look Bengali, your appearance is a bit Mongoloid.” He told her, “I am a Chakma from Rangamati and I am also an orphan and we are running an orphanage there.” She wanted to see our orphanage and was very interested to visit Rangamati. One day in 1979, my older brother accompanied Neige and her friend Tissa to Rangamati. At that time I was the Deputy Abbot at Ananda Vihara. I greeted them when they arrived. The area was under tight control because of the insurgency. We couldn’t get permission from the District Commissioner to take a boat to Parbatya Chattal Boudha Anath Ashram, so we had to walk. When we finally arrived she was very moved by what she saw; the atmosphere and the accommodations. She told us, “within a year we will try our best to help you.” In 1980 they started to support us financially and we renamed the school Moanoghar. We have expanded greatly since then. We now have primary and secondary enrollment as well as a technical vocational school. We run a community clinic and a range of other social programs. Presently, we have more than 1,400 children studying in Moanoghar. This includes 620 children who come from remote villages and board in the hostels. The remaining children attend the school from the neighboring villages. The children are from 11 different indigenous minority groups and all the three districts (Bandarban, Rangamati, Khagrachari) of the region. All the students receive free or highly subsidized education from Moanoghar. How did you decide to create a school here in Dhaka, the Banophool Adibashi Green Heart College? I spent 34 years as the general secretary of Moanoghar from 1974 to 2008. I came to Dhaka in 1987 to make a proposal to the European Union and PATAS to build a school here in Dhaka. The idea was to bring indigenous students to Dhaka after class five to provide a good foundation in English and also offer them access to better job and higher education opportunities. In 1990, PATAS and European Union approved my proposal to build a school here. For many years I would spend half of my time in Dhaka and half of my time in Rangamati. I was always moving. In 2008 I came to Dhaka permanently to run this college. At Banophool we now have 1,963 students in grades K to 12. Of those about 120 are indigenous students who are boarding with us. We have 110 teachers who teach in both English and Bangla mediums. They are broken into three faculties: science, commerce, and arts. All of our teachers have postgraduate degrees and we have very high academic standards. What do you see as the major achievements of Moanoghar and Banophool Adibashi Green Heart College over the past 40 years? I am happy with the progress we’ve made. Thousands of students have received Higher Secondary School Certificates from Moanoghar and Banophool. Many are now working in Dhaka as teachers, doctors, engineers, and even magistrates. We have seven or eight magistrates now who were students of Moanoghar. We even have graduates working in some of the top posts in the UN. Many have taken degrees from the Bangladesh Public Service Commission and are working to improve their country. Students have gone on to study in India, France, America, Canada, Japan, South Korea, and Malaysia and many are still working there. Some of my students now have ordained as Buddhist monks and we have sent many to Sri Lanka and Thailand to study Buddhism. My preceptor once told me: “Because you are an orphan boy, please try to do something for the orphans of the Chittagong Hill Tracts.” When I think of all of these students who are the graduates of Moanoghar and Banophool, in this sense I feel proud. I do see it as an important achievement. It is clear the academic standards of these schools are very high, but what makes them particularly unique is the cultural programs. How have Moanoghar and Banophool been important to the preservation of indigenous culture and identity? The schools have played a strong role in cultural preservation. The indigenous culture is very colorful, very vibrant. Bengali culture is also unique and an important part of our cultural programs as well. We have dance troops and instruction in traditional musical instruments and traditional weaving. We have instruction in painting. Suniti Jiban Chakma is very famous is a product of Moanoghar; he is a painter now working in France. Dana Moni Chakma is another famous painter. J.C. Chakma is well known singer, living in France. They are working to preserve our indigenous culture and share it with the world. People in Bangladesh are also impressed by our tribal culture, but the Bangladeshi government has made cultural preservation challenging for us. I try to explain to the government that if they supported the preservation of indigenous culture in the Chittagong Hill Tracts, Bangladesh can earn huge amounts of foreign currency from tourism. I know there is controversy around the term Adibashi (indigenous). The government has claimed there are no Adibashi in Bangladesh and have attempted to discourage the use of the term. You seem to proudly use Adibashi in the name of your school here. Have you encountered any problems with the name? The government doesn’t like us to use the term adibashi. If they accept it, the concept of adibashi, according to UN terms, then they have to grant us certain rights and privileges as indigenous people. When I took official registration in 2004 the name of the school was Banophool Adibashi Green Heart College. In 2010 they banned the term adibashi. This is because government is under a lot of pressure from religious fanatics and also the military. If the government gives me any problems, I will go to court! They registered our name in 2004, and now they are saying there are no adibashis in Bangladesh? We have been living in the Chittagong Hill Tracts for at least 600 years. There are many Mughal and British maps that show there were adibashi living in there. Now the present government now wants to say that we don’t exist? What would you want other people in the world to know about the indigenous communities in Bangladesh? I would like them to know that if kind-hearted people in America, Canada, and Europe extend their help and extend their concern regarding the problems of Chittagong Hill Tracts, maybe we can have hope in the future. If the media raises their voice and put pressure on the Bangladesh government, things might change. But now we cannot see any real hope from the Bangladesh government because they are a Muslim government. We see what is happening in Pakistan and in Iraq where they are gradually cleansing the Christian community. In Bangladesh they are trying to cleanse us as well, from the Chittagong region and even the whole country. They are sending Bengali people into the Chittagong Hill Tracts; we are now a minority there. They have money; they have support from the government. Sadly, right now the leaders of the Chittagong Hill Tracts are fighting each other. They are not united to defend our community. We are in a dangerous position because our indigenous leaders are divided into three groups and they are fighting each other—Parbatya Chattagram Jana Sanghati Samiti (PCJSS), who signed the peace accord with the government in 1997, Parbatya Chattagram Upajatiya Kalyan Samiti (UPDF), who rejected the peace accord, and those that follow the legacy of Manabendra Narayan Larma who was assassinated in 1983. After the peace accord, some years were spent peacefully, but gradually, the political leaders of our indigenous groups lost their unity. Now instead of fighting the military, these three groups are fighting each other. The present government is taking advantage of these divisions. Why is it important for the Buddhist clergy to be socially active in the Chittagong Hill Tracts? Is the Buddhist community a force that can restore unity? The Buddhist community is the indigenous community’s main resource in Chittagong Hill Tracts. We are the only ones providing quality education to the indigenous youth. We are trying our best to make education available to the impoverished and orphaned students. But the Buddhist community including myself, we are helpless. The government policies are very restrictive. Educated monks are not permitted to go to the Chittagong Hill Tracts. Probably even you were required to get permission from the District Commission when you visited Rangamati. Monks from Thailand, Sri Lanka, and even other parts of the country, if they wish you go to the Chittagong Hill Tracts they must get permission from the government. Are you worried now, after the attacks against Buddhists in Ramu? This current Awami League government is a bit more favorable to us, comparatively. If the Bangladesh Nationalist Party takes power, if Jamaat-i-Islami takes power, I don’t know what will happen. None of the major political parties are strong advocates for our community. During Ramu people from all the three political parties conspired to burn Buddhist temples and torture Buddhists. Our school in Dhaka here has even been attacked. Some years ago they used to throw stones and break our windows. This is why we had to cover the windows with mesh wire as you can see. But things are getting better now. They understand that we are giving education to their children. Most of the students here at Banophool, 90 percent, are Muslim. Out of more than 2,000 students only around are 150 Buddhist. Here Muslims, Hindus, Christians and Buddhists are united. We are all neighbors. Do you think that graduates of Banophool will emerge with a commitment to religious pluralism? This is my dream. We are doing our best to instill these lessons.